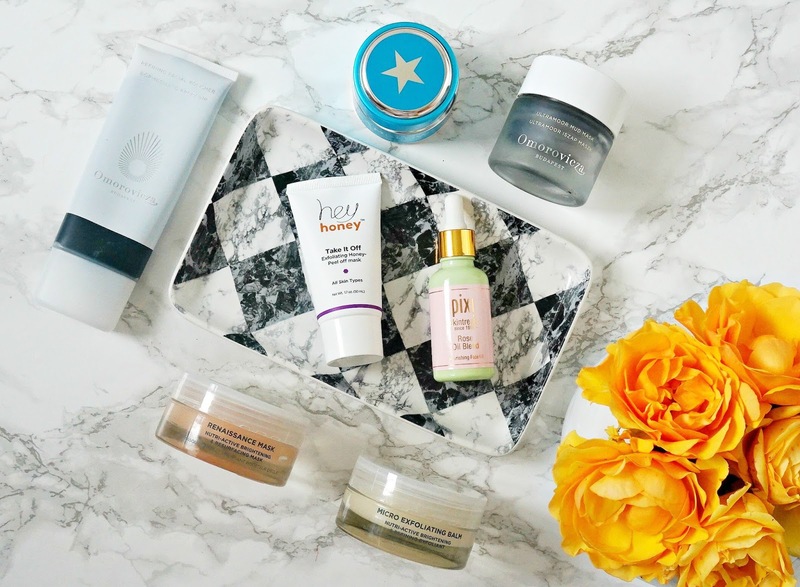 Although I like chemical exfoliators, I still use some physical scrubs too when I really feel like my skin needs something extra or as part of my pamper routine. The first is Oskia Micro Exfoliating Balm which is a balm that buffs the skin without stripping it at all. I find this balm to be really nourishing on the skin (it's packed with Omegas, B Vitamins and rosehip oil) and it reveals bright, soft, smooth skin. The other one that I love is Omorovicza Refining Facial Polisher which deeply cleanses, refines, tones and renews the skin in a very gentle way. It is green in colour when applied, I then massage it into my skin in circular movements, paying particular attention to the area around my nose and chin, it then turns grey and at this point, I leave it on my skin for around 2/3 minutes before rinsing. This leaves my skin looking very bright and glowing. Hey Honey Take It Off Exfoliating Honey Peel Off Mask: This is an exfoliator/mask hybrid. It is different from other masks in that it is applied over a light layer of moisturiser rather than on clean skin. I apply an even layer of this honey mask (avoiding eyebrows and hairline) and leave it to dry completely then I peel it off (which I find very satisfying, especially if I get it all of in one go!). This is an extremely gentle, yet effective, exfoliating mask suitable for even the most sensitive skin. Now we move on to my three favourite masks that I have waxed lyrical about several times on the blog so regular readers won't be at all surprised! The most hydrating mask I have ever tried is GLAMGLOW ThirstyMud. I just love what this caramel-scented mask does for my skin - I always wake up to plump, soft, smooth skin and the hydrating effect lasts a few days. I can't recommend this mask enough! To deeply cleanse my skin, I love Omorovicza Ultramoor Mud Mask. I have previously described this as "Spanx for your face" because it really does lift and firm the skin, whilst it cleanses and the result is very clear, glowing skin that looks like I've just had a facial. My all time favourite mask is Oskia Renaissance Mask. This mask does it all - exfoliates, brightens, renews, hydrates and refines the skin. I apply a small amount of this peach coloured mask and massage it into my skin until it turns white - at this point the fruit acids start to work so I leave it to do its thing for around 15 minutes before rinsing. My skin always looks polished, bright, refined, even and so smooth after using this mask. I highly recommend it to everyone! Finally, the only oil that I have used since I bought it is Pixi Rose Oil Blend. This is a cocktail of sweet almond, jojoba, rosehip, pomegranate seed and rose geranium oils all of which deliver intense moisture to the skin without feeling overly greasy. I love to massage 2/3 drops of this in as a final step in either my pamper routine or my evening skincare routine. This oil makes my skin so soft and plump and it looks so much brighter and calm. One of my favourite oils ever! I know it may seem to a lot of people that my skincare collection is still quite large, but this is very streamlined for me! I'm not saying that I won't use the other products in my collection but I am happy to stick to a consistent routine and when I finish some of these products, I will introduce some of the other products that are being neglected at the moment. The consistency of this routine has given me great results and I'm so happy to have my skin looking good again - despite being very ill recently, I was still told that my skin was glowing so it was confusing people! I would love to hear what your favourite "extra" products are in the comments below! All products are bought by me, unless otherwise stated. In this case the Hey Honey Mask was sent to me. Opinion is always my own.